The key changes are the query now returns both a start_date and end_date for each row, there's no no recursion and for dateparts that don't involve time intervals, the UDF will strip out the time automatically. This makes it very easy to use with the getdate() or getutcdate() functions in SQL Server. The introduction of the start_date and end_date columns also changes the syntax of the queries a bit. 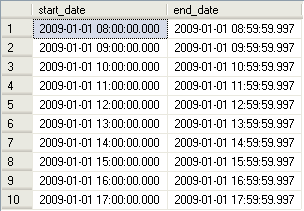 To take use of the start_date and end_date columns, you'll want to join rows based on whether the time falls between the start_date and end_date columns. As you can see, our aggregate query is showing the correct results for hours broken down by hour for this day. If you have any other tips or suggestions, I'd love to hear them. This approach might not be the best approach for every problem, but it'll work well for when you have date/time ranges that are very dynamic and are limited to a pretty small resultset (under a few hundred rows.) This works perfectly for creating records sets of the last few years broken into quarters, or the past year broken down by month, etc. This is very handy Dan. I need to dig up my old business day routines and see if I could make this apply. I find your function very useful! Cool runtime "Time Dimension" on demand in a data warehouse environment, I would say. Just enough to display those 0 values. 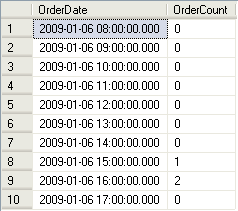 One question, although when I pass in string dates like '2009-01-01 00:00:00' it works but when I pass in dynamic MS SQL date functions like the following it breaks. SQL Error: Line 4: Incorrect syntax near '('. Is the function accepting only string value dates? Are you using the example you posted exactly? I don't have quick access to a MSSQL 2000 at the moment, but it should work fine with dynamic datetime functions. I'm using the exact syntax above in a query I've been running. The function just requires a datetime object. You are a rockstar, daddio. Your function performs well, is crazy flexible, and your *.sql code is neat / clean / easy to follow. +1, and well done! First, thanks for the great function, Dan! While the error is extremely unhelpful, I wonder if it's permissions problem. It is strange that it appears to fail on the internal SQL functions, but still feels like this might be permission based. This person was having the same problem and their solution was to use OPENQUERY to solve the issue. Thanks very much for this procedure Dan. It's helped with a number of reports! Recently I needed it in MySQL, converted it and thought I'd share.